Preheat oven to 350 degrees F (175 degrees C). Butter one 9 or 10 inch springform pan. Combine the chocolate wafer crumbs, softened butter, 2 tablespoons white sugar, and the cinnamon. Mix well and press mixture into the buttered springform pan, set aside. In a medium sized bowl beat the softened cream cheese until smooth. Gradually add 1 cup white sugar mixing until well blended. Add eggs, one at a time. Beat at low speed until very smooth. To Make Flavored Whipped Cream: Beat whipping cream until soft peaks form, then beat in confectioner's sugar and 2 tablespoons coffee liqueur. 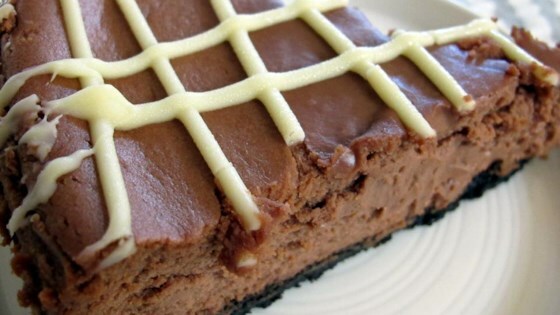 See how to make sinfully rich and chocolaty cheesecake.